Tis the Season: Holiday on the Lake! Kent Police are on the look out for a bicycle bandit who robbed Deli Land, a popular delicatessen on Route 52 in Lake Carmel Tuesday night. Police Chief Alex DiVernieri said the stocky bandit entered the business around 7:30 p.m. and announced a st… Please login below or purchase a subscription to the Putnam County Courier to access this content. Despite objections from Legislators Barbara Scuccimarra of Garrison, Sam Oliverio of Putnam Valley and Lou Tartaro of Kent, the Putnam Legislature has tabled a motion by a 5-3 vote to ban polystyrene foam disposable food service containers used by c… Please login below or purchase a subscription to the Putnam County Courier to access this content. Southeast’s recently adopted 2015 town budget of $16 million falls within the state mandate of the town’s tax levy—the total amount of property tax revenue collected for a fiscal spending plan. While the budget-to-budget increase t… Please login below or purchase a subscription to the Putnam County Courier to access this content. Residents in the Brewster School District will be going to the polls next Tuesday to vote on a $38.9 million bond referendum that will upgrade facilities while taking care of long standing problems and inadequacies found throughout the district’s va… Please login below or purchase a subscription to the Putnam County Courier to access this content. 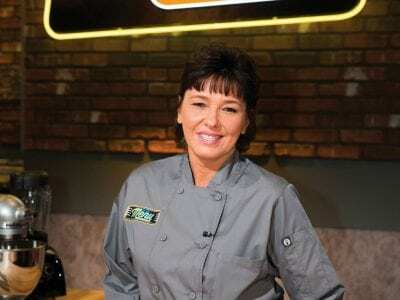 Lynn Duffy, ready to compete, on TNT’s “On The Menu.” On Friday night friends gathered at the Duffy home on Mill Road in western Putnam. Loud shouts and cheers could be heard booming from the family residence as Putnam’s own Lynn Du… Please login below or purchase a subscription to the Putnam County Courier to access this content. The Santos family members welcome home Michael, at rear, for an emotional Thanksgiving. Recall that one of this year’s saddest stories in Putnam County happened on May 10, when Helen and Michael Santos were traveling on Route 9 early in the morning f… Please login below or purchase a subscription to the Putnam County Courier to access this content. Putnam County Judge James Reitz serves Dan Greaves of Kent Cliffs turkey dinner on Thanksgiving. The tradition continued— for the 32th consecutive year, George’s Place, a popular restaurant in downtown Carmel opened its doors to provide a… Please login below or purchase a subscription to the Putnam County Courier to access this content. 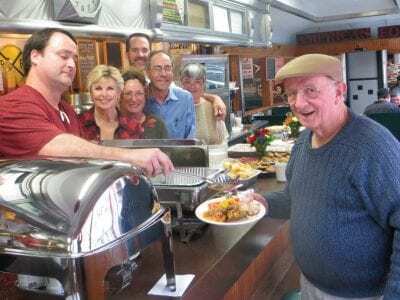 Bob Burst of Brewster is served a delicious meal by members of the Sprague family and friends on Thanksgiving Day at Bob’s Diner in Brewster. The greater Brewster community came together for the seventh consecutive year on Thanksgiving Day by p… Please login below or purchase a subscription to the Putnam County Courier to access this content.